Para desbloquear el contenido exclusivo con el código, sigue estas instrucciones en función de la plataforma en la que estés jugando. Inicia Steam y accede con tu cuenta de Steam. Abre el menú Productos desde la parte superior de la ventana de Steam. Selecciona Activar un producto en Steam. Sigue las instrucciones que verás en pantalla para completar el proceso. Ve a la Tienda Xbox Games y selecciona un código o di "Xbox, usar código". Indica tu código de 25 caracteres. Alternativamente, puedes usar el mismo código en live.xbox.com (recuerda: el código de descarga de Xbox Live solo es válido para un uso. Sujeto a los términos y las condiciones indicados en www.xbox.com/live). Crea una cuenta de PlayStation™Network o usa la tuya si ya tienes una. Selecciona el icono de PlayStation®Store en la pantalla de inicio del sistema PS4™. En PlayStation®Store, selecciona la opción Canjear código que hay al final del menú. Indica el código diferenciando entre mayúsculas y minúsculas, o no funcionará. Cuando hayas indicado el código correcto, selecciona Continuar en el cuadro de diálogo. Selecciona Descargar para iniciar la descarga del contenido. Haz clic derecho sobre el nombre del juego en la biblioteca de Steam. Selecciona "Propiedades". Ve a la pestaña "Archivos locales" y selecciona "Ver archivos locales". Encontrarás un archivo llamado "VRally4.log". Mantén pulsado Windows+R en tu teclado. Escribe dxdiag en el campo textual que aparece y luego selecciona "Aceptar". Si tu equipo tiene una versión de 64 bits de Windows, haz clic en el botón "Ejecutar 64-bit DixDiag". Selecciona el botón "Guardar la información..." de la parte inferior de la ventana. - Todos los archivos del directorio "My Games: Los encontrarás en la carpeta "C:/Usuarios//Mis documentos/My Games/VRally4/". Necesitas una conexión a Internet y una cuenta gratuita de Steam para activar el juego. Los requisitos recomendados del sistema permiten que el juego funcione a una resolución de 1080p a 60 fotogramas por segundo, con todos los efectos visuales en su configuración por defecto. Los requisitos mínimos del sistema permiten que el juego funcione a una resolución de 720p a 30 fotogramas por segundo, con todos los efectos visuales configurados al mínimo. Every player has personal expectations when it comes to drive a racing wheel, some prefer strong feedbacks, others prefer more emphasis on tyre slip feedback while driving on gravel, etc. While developing V-Rally 4 we wanted to make sure players can configure axes and wheel feedback to have their racing wheel behave as they want it to. This documentation explains how to optimize racing wheel settings in V-Rally 4. Each axis (throttle, brake, clutch, steering) can be configured using multiple parameters. The first 3 parameters provide a way to change how much the logical (in-game) axis input is detected depending on how much the physical axis is depressed. 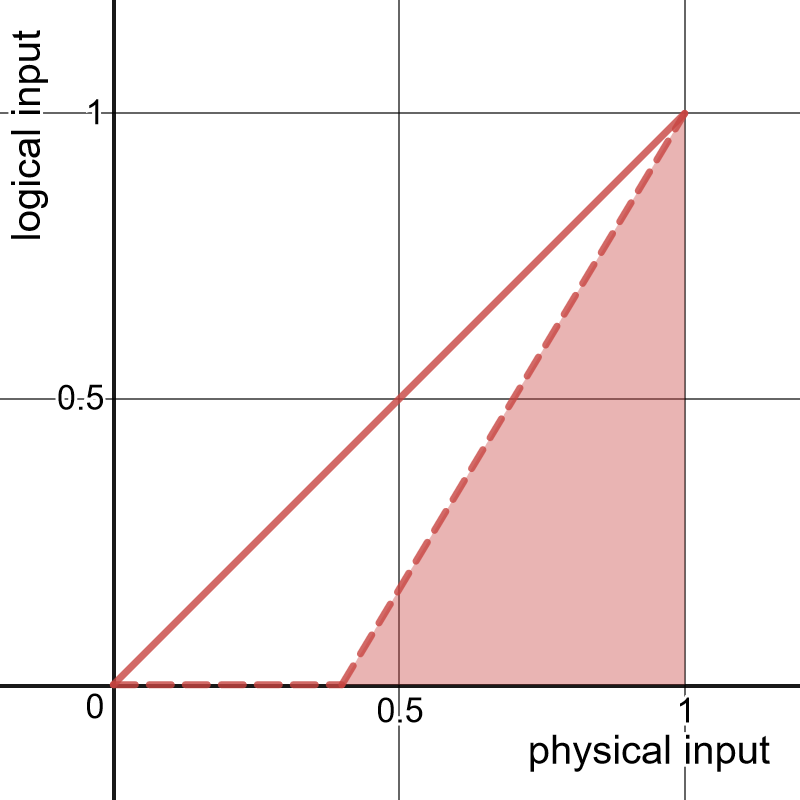 With the default values, the logical input exactly matches the physical input, which means depressing your pedal halfway results in a 50% logical input as well. In other words the game handles your raw axis input without filtering it. For various reasons you may want to adjust this using deadzone, saturation, or sensitivity. The deadzone is a "no input" zone at the beginning of the axis. With a 10% deadzone, you won't get any logical input unless your physical axis is depressed to more than 10%. 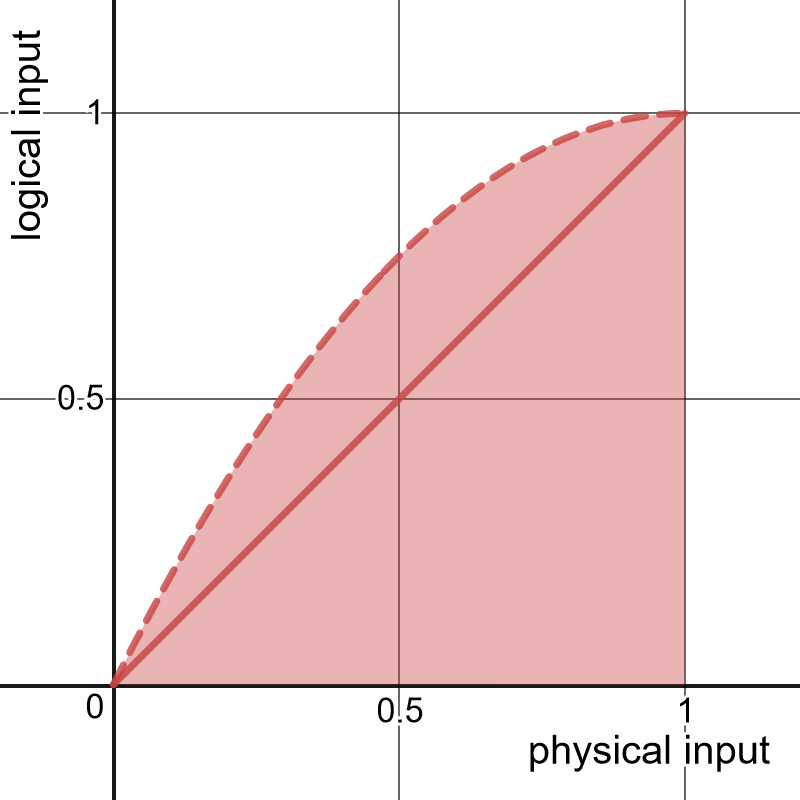 Physical input to logical input illustration with deadzone set to 40. Usage: Typically you'll want the smallest deadzone possible for the best precision, but you may require one for some axes. When an axis sends unwanted small input signals to the game even when it's not being depressed at all, a small deadzone will be needed to filter those out. Also called linearity, sensitivity allows to get more logical input either at the start or at the end of the physical axis. Using sensitivity, you can make logical inputs more reactive when you depress your axis lightly, or on the contrary when you depress your axis further. 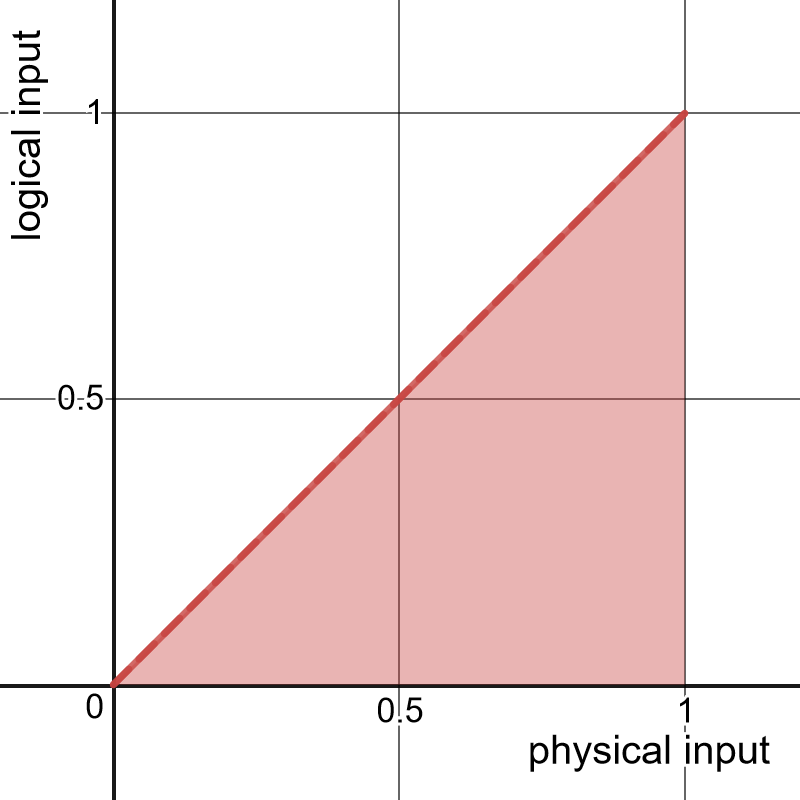 Physical input to logical input illustration with sensitivity set to 5. Usage: For instance, if you feel like your car is braking too hard even when you depress lightly your pedal, decreasing the brake sensitivity will help. Another example may be if you feel like your car is not turning enough when you turn your steering wheel lightly, but you don't want to change the maximum angle (which is the basically saturation by the way), increase the steering sensitivity. Deadzone and saturation altogether create an "active zone" of the physical input outside of which the logical input will be either zero (deadzone) or maxed-out (saturation) in-game. Inside your active zone, you can tweak the sensitivity to make axis more reactive either for smaller inputs or for bigger inputs, as you prefer. Those two parameters are useful if you are using a device which is not officially supported by the game. If the device sends negative numbers to the game for an axis, "invert" must be toggled on. If the device combines two of its physical axes into one single logical axis, "combine" must be checked. Usage: If depressing your physical axis results in no in-game input, try checking "invert". If your axes seem mixed up even though you reassigned them manually, try toggling "combine". Along with axes settings, the in-game menus are here to help you configure your wheel effects. There are three types of effects: force, damping, and vibration. - Force is an effect that will turn your wheel if you're not holding it. - Damping is a feedback that makes the wheel harder to turn. - Vibration makes your wheel rumble, either with a high frequency or low frequency (shakier). The "overall force" slider scales all forces applied by the racing wheel. It is useful for a really quick tuning but at some point, you'll want to use other sliders to be more selective. Overall force will impact both the "Self-aligning torque" and "Center force" parameters explained below. Usage: move this slider down if you feel like your racing wheel is too violent and sending too much active force to your arms. Move it up if think the racing wheel is too soft and you would like to be required more effort while driving. This slider scales the base damping of your racing wheel, which will give it a lighter or heavier feeling. In some in-game situations, the final damping may be temporarily increased but it will never be lower than the base damping. Usage: If you if you feel like your wheel is too heavy and you need a too much force to steer it even if you're not driving fast, reduce the base damping. If you don't like your wheel being too light and easy to steer, increase it. Self-aligning torque (SAT for short) is the most important component of the racing wheel effects. In a real car, SAT is the force applied on the vehicle's wheels that make them turn left or right, depending on parameters like velocity and friction. This force is transferred to the steering wheel and to the driver's arms and can give you information to counter-steer efficiently for instance. Usage: If you feel like your wheel is too violent and is sending too much active force to your arms in situations like steering at high speed, move this slider down. Move it up if you would like the road and car information being transferred to your arms with more intensity. The "overall vibration" slider simply scales up or down the vibration from all effects. Just as "overall force", it is useful for a really quick tuning but at some point, you'll probably want to use other sliders to be more selective. This slider will impact the vibration sent by the "Suspension", "Tyre slip", "Collision", "Ground surface", and "Engine" effects. Usage: Tweak the overall vibration if your racing wheel is vibrating with too much or not enough intensity in general. If you just want to change the vibration intensity in a specific situation (like when your car is drifting) and you're fine with it in the other situations, try checking out the other sliders. This slider will scale the intensity of the vibration effect that informs you about shocks being received by your car's suspension. Usage: Move it up if you can't feel clearly enough the car suspension in your racing wheel, move it down if you don't want to feel this information with so much intensity. This slider scales the intensity of the vibration effect applied when your tyres are slipping on the ground. Usage: Move it up if you want to feel the tyre slip vibration with more intensity, move it down if you think it's too strong. This slider scales the intensity of the vibration applied when your car collides with an obstacle or another car. Usage: Move it up if you want more vibration intensity during collisions, move it down if you prefer less. This slider scales the vibration intensity of the effect applied when you're driving on certain surfaces, mainly off-road, like grass. Usage: Move it up if you want more intense vibration when your car is off-road, move it down if you want less intense vibration. This slider scales the vibration applied by the wheel during certain engine situations like overrevving. Usage: increase this if you want to feel stronger vibration when your engine is overrevving, decrease this if you don't want to feel this vibration that much. The center force sets your racing wheel back to neutral position when you start a race or when your car is respawned. Usage: Set this to 0 if you don't want your racing wheel to be automatically reset or scale the force according to your liking. Some pedal devices are equipped with vibration motors. When such hardware is used connected to a racing wheel, these specific sliders may be used to scale vibration being applied to the pedals. Usage: Increase this if you can't feel the vibration being applied by your pedals as strong as you want. The "Force and vibration" menu provides quite advanced options to configure your racing wheel experience. If despite this you're still not fully satisfied, you can try editing the configuration file SteamLibrary\steamapps\common\VR4\Common\Settings\InputFFBConfig.cfg with a text editor. Remember to save it and relaunch the game after making any changes to this file. The InputFFBConfig file contains two main blocks. The first block is called the "Hardware config". Parameters within this block allow to tweak the intensity of the effects applied by your racing wheel, per hardware manufacturer. There are six types of hardware effects handled by V-Rally 4. 1 - Constant force: this is a force that will turn your racing wheel if you're not holding it. 2 - Spring force: This is like the constant force with an intensity varying depending on how far the racing wheel is being steered from its center. 3 - Damping: this is a force that will make the racing wheel resist when you're steering it, but will not steer it actively if you let it go. 4 - High frequency vibration: this makes your racing wheel rumble. 5 - Low frequency vibration: this makes your racing wheel rumble in a shakier way. 6 - Specific vibration: some hardware provides additional vibration effects in the pedals. For each of these effects, there are 3 parameters. These are all clamped to [0;2] (0 to 200%). Setting a value higher than 1 may saturate the effect. When the hardware motor is applying max intensity, the effect is saturated which means that if the game sends an even higher intensity effect, you won't feel any change until it gets back under the max hardware intensity. By keeping values under the saturation threshold, you get more precise effects, adapted to the intensity range of the hardware motor. - Factor : this is a number that will be multiplied to the effect intensity. Usage: For instance, increase ConstantForceFactor in the block of your racing wheel's manufacturer (Thrustmaster, Fanatec, Logitech, or Default for others) if you think that its force motor is delivering a constant force which is too weak. Another example: decrease VibrationHighFreqFactor if you think that the high frequency vibration should be more intense in general (independently of any specific in-game effect). - RangeMin : this sets the minimum intensity that the effect can have when it's active. Usage: Increase this if you can't feel the effect at all when it's supposed to be low intensity but still be noticeable. - RangeMax : this sets the maximum intensity of the effect when it's active. If "RangeMin" is 0, "RangeMax" has the same effect than "Factor". Usage: Decrease this if you think a hardware effect is delivered with too much intensity by your racing wheel. The "Software config" block, provides you with ways to change the force and vibration settings more in-depth than in the option menu. Tweak these if you could not reach a satisfying config by just using the in-game sliders in the option menu. These factors work with the sliders in the option menu "force and vibration". They change how a specific value on the corresponding slider will act on the associated effect. In some cases, a single slider is associated to multiple sub-effects, you can also change these sub-effects with these factors. As always, beware of saturating effects by setting a combination of factors that will result in a final value higher than 1 (100%), which may saturate the effect. When an effect is already saturated and the game wants to apply more intensity, you won't feel it because the hardware is already applying maximum intensity. - OverallConstantForceMax: this defines the internal intensity of the constant force when the "overall force" slider is set to its maximum value (150). Usage: Tweak this if you want to independently change the constant force and the spring force (both controlled by the "overall force" slider). - OverallSpringForceMax: same thing with the spring force. - BaseDampingMax: this defines the internal damping intensity when the "base damping" slider is set to its maximum (150). Tweak this if you want to change the scale of the whole "base damping" slider. - SATforceMax: same thing with the "Self-aligning torque" slider. - OverallVibrationHighFreqMax/OverallVibrationLowFreqMax: these factors respectively define the internal intensity of the high freq and low freq vibration effects when the "overall vibration" is set to its max (150). Usage: tweak these to change the intensity of high and low frequency vibration independently from one another. - SuspensionVibrationMax/TireSlipVibrationMax/GroundSurfaceVibrationMax: these define the internal intensity of the in-game effects when the "Suspension", "TyreSlip", "Ground Surface" sliders are set to 150. Usage : use these factors to change the meaning of the slider values in terms of effect intensity. If you want your default settings to be 100/150 in the menu, or increase the maximum, you can do this with these parameters. - EngineIdleVibrationMax: this defines the internal intensity of the idle engine effect (disabled by default), when the "engine" slider is set to 150. Usage: increase this if you want vibration when your car is idle. If you set this factor to 1, and the "engine" slider in the option menu is 100/150, you will have a `1*100/150=0.67` (67%) intensity vibration applied when the car engine is idle. The final value also takes in account the vibration factors (VibrationLowFreqFactor, VibrationLowFreqRangeMin, VibrationLowFreqRangeMax, OverallVibrationLowFreqMax, and the "overall vibration" slider). - EngineOverRevVibrationMax: same thing for the overrev vibration. - EngineGearChangeVibrationMax: same thing for the gear change effect. Usage : Set this to 0 if you don't want the effect when you change gear. - EngineRPMvibrationMaxStartRace: same thing for the effect applied when you're revving your engine during the countdown. - EngineRPMvibrationMaxInRace: same thing for a vibration effect being applied depending on you current engine speed (disabled by default). Usage: increase this if you want vibration informing you of how fast is revving your engine at all times. - CollisionImpactVibrationMax: this defines the internal intensity of the effect when the "collision" slider is set to 150 and your car is colliding to an obstacle. Usage: tweak this to change how intense is the collision vibration independently from the collision slide vibration. - CollisionSlideVibrationMax: same thing for the effect when the car is sliding against an object like a fence. - CentreForceMax: defines the internal intensity of the effect when the "center force" slider is set to 150. Usage: Tweak this if you want a more or less intense wheel auto-recenter effect. - ThrottlePedalVibrationMax/BrakePedalVibrationMax: Same thing for the specific hardware vibration. 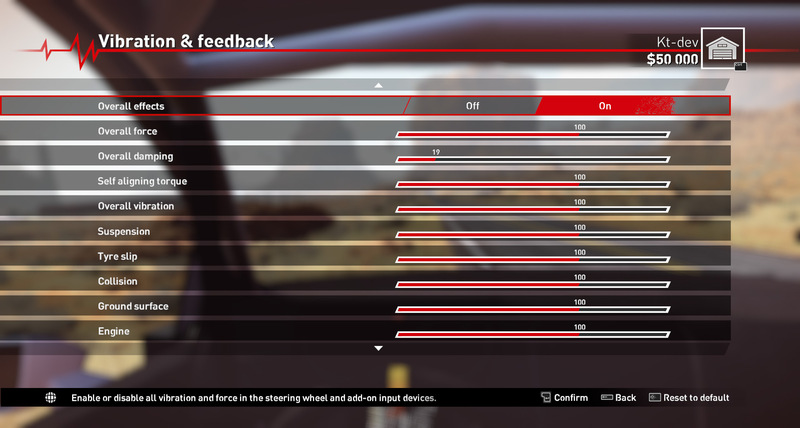 The following values will directly change what in-game situations result in effects being applied by your racing wheel (as opposed to changing only how intense they are, like the previous parameters). If you don't like something about a effect in a specific in-game situation, you can try looking below if there is a factor related to this effect to help. - SATminForceDeadzone/SATmaxForceDeadzone: To reduce oscillations with some racing wheels, the SAT effect has a "0 force zone" (similar to a deadzone) around the wheel center. This zone is smaller at low speed, down to the minimum factor, and bigger at high speed, up to the maximum factor. You may prefer no deadzone even if it results in more oscillations. Usage :Tweak this to change the size of the "no force zone" in the SAT effect, or to completely remove it. - SATminDampingZone/SATmaxDampingZone/SATdampingZoneTransition: To further reduce oscillations, a damping zone can be added in addition to the "no force zone". This is disabled by default because with racing wheel which force engine is powerful, it can create an unpleasant bump when counter-steering. The damping zone increases with the car speed: when the car is stopped its size is defined by SATminDampingZone and when the car is at max speed it is SATmaxDampingZone. The SATdampingZoneTransition defines how much of the zone should be used as a transition, which makes it smoother but results in less damping. Usage: Increase these parameters if you want to reduce the racing wheel oscillations produced by the SAT effect. - SuspensionSmallThreshold: This is the compression threshold above which a "small" suspension effect is triggered. Usage: Decrease this to have more suspension feedback. Note: the suspension feedback may overshadow the tyre slip feedback if the threshold is too low. - SuspensionBigThreshold: This is a second threshold for a bigger suspension feedback, similarly to the SuspensionSmallThreshold. - TireSlipDriveTiresFactor/TireSlipNonDriveTiresFactor: This factor is used to scale tyre slip feedback applied when the car's drive wheels are slipping. Usage: Increase TireSlipDriveTiresFactor and decrease TireSlipNonDriveTiresFactor if you want more intense feedback to inform you that the drive wheels are slipping. - TireSlipVibrationThreshold: This is a value that reduces tyre slip feedback to filter out small unwanted slip feedback. Usage: Decrease this if you want an earlier feedback in your drift, but this may also give you feedback when you're not really slipping in some situations. These surface factors are useful to increase and decrease the tyre slip effect depending on what surface is being driven on. Usage: Change these if you want a more or less intense tyre slip effect on a specific surface. - GroundVibrationWheelsEasePow: This value is used to scale the ground surface effect depending on how many wheels are driving on the bumpy surface. Usage: decrease this if you want a more intense effect when less wheels are rolling on a bumpy surface, to have a stronger warning than you should get back on the track. - GroundVibrationSpeedFade: The ground surface effect is scaled on the car's speed, resulting is more effect at high speed. This value sets the speed % at which the max intensity of the effect is reached. Usage: decrease this value if you want more intense ground vibration effect at lower speed. These surface factors are useful to increase and decrease the ground vibration feedback depending on what surface is being driven on. Usage: Change these if you want a more or less intense ground surface effect on a specific surface. - CollisionVibrationMaxDuration: This is the max duration of the collision effect. The final duration also depends on the impact's strength. Usage: Decrease this if you want a shorter collision effect, increase if you prefer a longer collision effect. - CollisionSmallObjectFactor: This is the mass of objects that are considered "small" and will result in a less shaky effect upon collision. Usage: Decrease this if you want more lightweight objects to give a bigger collision effect, increase it if you want heavy objects to give a smaller collision effect. - CollisionSlideMinVibration: Vibration output while sliding against an object is faded over speed. This is the min vibration, to avoid having a 0 feedback at low speed. Usage: Increase this to have a bigger collision effect while sliding against an object even at low speed. With these parameters you can change a lot of things in the way V-Rally 4 sends effect to your racing wheel. Share your config with us on [Steam] or Facebook on the [V-Rally 4 page] ! © 2018 Publicado por Bigben Interactive y desarrollado por Kylotonn. ¡Suscríbete a nuestro boletín de noticias de V-Rally 4 para recibir las últimas novedades, vídeos, imágenes y ofertas exclusivas!